Holiday Season 2012 is Quickly Approaching – Check out a new contemporary wreath chandelier design! 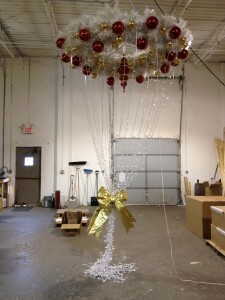 › Who We Are › Our Blog › Holiday Season 2012 is Quickly Approaching – Check out a new contemporary wreath chandelier design! Wow - with the July 4th holiday now behind us - we are beginning to ramp up production for the upcoming 2012 Holiday Season - we cannot believe it is upon us already! We thought we would share a photo of one of our latest creations. A clien...t contacted us needing white overhead wreath chandeliers, but with a traditional red and gold ornamentation theme. The picture below shows a newly produced wreath chandelier undergoing mid-production quality control testing and evaluation. Before any order goes out the door - we make sure that it not only meets the clients expectations, but also exceeds industry standards in terms of manufacturing and safety specifications!